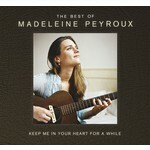 Keep Me in Your Heart for a While: The Best of Madeleine Peyroux is the very first compilation release in the singer/songwriter's 18-year career, including favorites not only from her Rounder catalog, but also tracks from her Atlantic and Decca/Emarcy catalogs. Additionally, the album includes one previously unreleased song-title track and Warren Zevon cover, "Keep Me in Your Heart"-which appeared in 2011's independent film Union Square. Liner notes by former Atlantic Records A&R man, Yves Beauvais, complete the package. Peyroux, whose voice is often compared to that of Billie Holiday's, was discovered while in her early twenties, when Beauvais spotted her at a New York club. He recalls the precocious singer's set to be "some of the most exciting, viscerally moving minutes of my music-listening life." Beauvais signed Peyroux to Atlantic and co-produced her 1996 debut Dreamland. Peyroux's husky voice enchanted audiences and critics alike, but it was 2004's Careless Love -a wide-ranging collection of covers from Elliott Smith to Leonard Cohen-penned tracks-that proved to be a milestone release for the artist, fetching mainstream recognition and marking the start of a four-album-long collaboration with producer Larry Klein (Joni Mitchell, Tracy Chapman, Herbie Hancock). The American-born Peyroux, whose career began as a teen busker on the streets of Paris, is a regularly touring, active artist, who has often returned to her love of busking between albums.